It was a Monday. All of Allison’s 5 original larvae had made the metamorphosis into butterflies by Sunday evening. We had enjoyed watching the transformation. The seemingly lifeless chrysalis had remained unchanged by our eyes for the entire last week. And yet, life emerged from this chrysalis, and not just life, but a beautiful new Painted Lady butterfly came out of each chrysalis. We had watched these butterflies from the tiny larvae, grow into fat caterpillars, make their chrysalis and now emerge, fully formed and simply amazing. Yesterday was also Mom’s birthday and we finally had that big celebration of her life. We had chosen to have a birthday cake and to release red balloons, seventy-four balloons to celebrate her 74th birthday, released without strings to protect the environment. 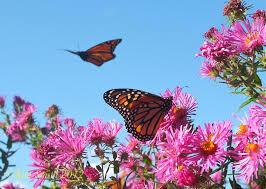 During a conversation with my children about Allison’s butterflies, I had mentioned they were due to “hatch” on Mom’s birthday. We so loved this idea that we ordered Monarch butterflies for each of her children, grand-children, great-grandchildren and nieces to release. We released them to “Untitled Hymn” as the chorus sang, “fly to Jesus.” It was a beautiful moment. I had also taken a small amount of Mom’s ashes and placed them in a biodegradable, red, heart-shaped box. As part of the memorial service, the box was placed in a pot with a red rose tree, and our family and guests shoveled the soil to help us plant the rose tree in remembrance of Mom. Gift 1: The gift of faith, indeed, faith like a child. Thanks God and Allison for cooperating in that one! Gift 2: I had often in my life struggled with the commandment to honor your mother and father. How do you honor someone who had abused, neglected, and abandoned you? And yet, as the end of my mother’s journey drew near, I found myself responding to someone angry that I was caring for my mother. And my response, “It is my honor to care for my mother.” Thank you Jesus for this awesome gift that I didn’t realize you were giving me until the words emotionally poured out of my mouth. Gift 3: My sister and I and many friends from my parish were praying for my Mom’s conversion. As I sat bedside with my mom unconscious, I was given a vision of Mom, through Jesus’ eyes. He didn’t see her in her brokenness, He only saw her as a child He loved. Indeed, as one of His lost sheep. And He called her by name back to him. For the first time in my life, I didn’t see my mother as a mother who had abandoned me, but as a child of God, loved simply for love’s sake. And I knew in that moment, Mom would be okay. And I would too. And Gift 5: As the day faded into evening, I sat with my family at the dinner table discussing the beautiful service. I remarked that I couldn’t wait for the first rose to bloom on the rose tree where we planted Mom’s ashes. “It was just empty and laying there,” Allie replied. “We threw it out, because the butterflies were already out,” she stated. WOW. God. Just as you promised, You were there with us all along. In the suffering, one might miss it. But reflecting back, Jesus who loves us and hates death, was there in every moment of our journey. Subtle and simple, but true. I am reminded how his divine providence works so wondrously and so mysteriously. For it is only on this day, after Grandma Bobbi’s journey is complete, that I am able to see how the caterpillars transformation was identical to my Mom’s all along. I am humbled at all the gifts that were given to us during this journey. I pray for you as we finish Lent, that you have found your own transformation. That you are able to leave behind what needs to die in you, so that you will be transformed as God intends for you. awesome God so good. His love shines in you. What a beautiful reflection and story you shared with Allison so she too could understand at age 6 what happens when a person dies. You are my inspiration!